The squabble between state Senate Republicans and Governor Tom Wolf is ramping up. A Senate committee on Tuesday brushed aside Wolf’s recall of 28 nominations made by his predecessor. Instead, the panel approved 13 of the 28 nominations made by former Governor Corbett in the twilight of his term, queuing up the names for a confirmation vote in the full Senate. Senate GOP spokeswoman Jennifer Kocher said the same committee would eventually take up the remaining 15 Corbett nominations. “We’ve taken a secondary look at their qualifications, and deemed that they are qualified to continue to serve in the capacities that they were already serving,” said Kocher. 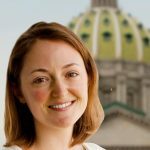 Wolf rescinded the lame-duck nominations last week, calling the process behind the selections “murky.” He also removed Corbett appointee Erik Arneson from the director’s chair in the Office of Open Records. Senate Republicans filed suit in Commonwealth Court Monday to challenge the removal. Senate Democrats said Wolf’s recall of nominations should be respected. Republicans said they’re respecting Corbett’s power to make nominations during the full length of his term. Kocher pointed out that the nominations were for non-paid positions, and most were reappointments. Among the new nominations are former Revenue Secretary Dan Meuser, picked to serve on the Board of Governors for the State System of Higher Education, and former Lieutenant Governor Jim Cawley, selected to be a trustee on Temple University’s board. The committee-approved nominees still need to be confirmed by a simple-majority vote in the full Senate.